Photography and Cinematography, a comparison. Victoria Memorial, Buckingham Palace, London, Sunday 9th June 7:10 AM. Snapshot about 10 months ago. Buckingham palace is not this busy at 7am on a Sunday. A surprisingly chilly and gloomy Sunday outside the Royal Palace considering that the day before crowds of naked cyclists riding were riding by. 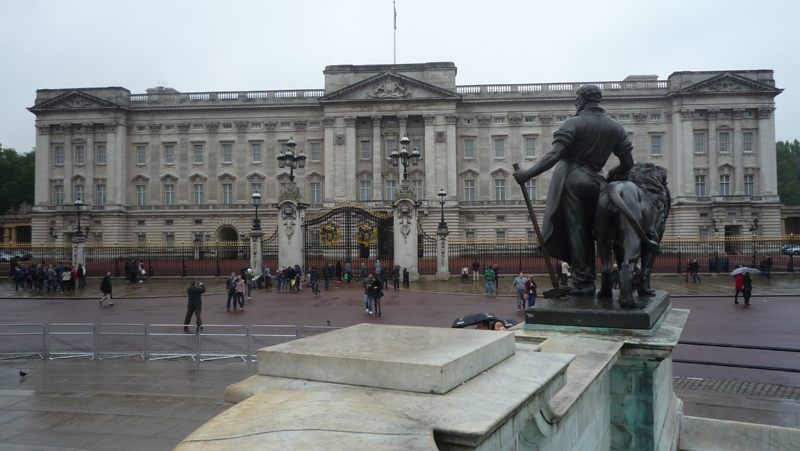 On this day however, an exhausted Marc was dragging himself in the direction of Victoria Train Station along the wide roads that lace the palace grounds. An alarm bleeped from a pocket in my jeans. A loving reminder that I had woken up 24 hours ago to start working on the Mr Happy set. Having only finished working and left location around 20 minutes beforehand, Marc was a tired boy after working what must of been a good 22 hour shift. Oops. Considering how rigid the structure of command is in a film crew, and how quickly on-set weirdness can be normalised, one can still be surprised in how unpredictable and wildly varying work can often be when filming. Working as the photographer on set puts you in a very unique position. The mix of being uncritical to the production of the film itself and occasionally having large blocks of waiting to be busy means that frequently I’m roped into helping with all kinds of things. I’ve operated booms, been an extra, helped block off roads, set up lights, plucked strangers off the streets to be extras, constructed sets, found information, found props, I’ve even been ordered to sit at a bar and drink to keep the location owner happy! Being a camera guy I also tend to be close with the cinematography teams, who are almost always extraordinarily hard working and good people. I have huge amounts of respect for camera department, I’ve always said that they effectively do my job, but it’s 24 times harder. It’s not uncommon for my to provide some sort of assistance to cinematographers, if I’m asked for opinions or equipment I’m usually happy to oblige. It usually amounts to moving equipment, looking after the camera while the operator has to leave set for a short while, or even just lending my lens cleaning tools. In all my time however, I’ve not been asked to operate a video camera for production purposes, I’ve genuinely spent more time being in front of a video camera then actually using one. All that changed when I started working on Eugene Magee’s Mr Happy short film. After shooting the main bulk of the film it was later decided that they needed to shoot some additional footage with a minimal crew to tie things up. This is frequently called shooting “pick-ups”. I was originally asked to just come along and take some pictures, because it never hurts to have extra coverage. When I saw that they were looking for camera people on Facebook the day before shooting it never even dawned on me that I might be asked to help. One of the few photos actually taken on the day. I’m frequently asked whether I’m considering a move into cinematography, by both new acquaintances and long friends alike, because the fundamentals of the job are clearly very similar, and because I’m constantly grumbling about the limitations of still photography as a creative medium. Every time I have answered with a resounding “No. I have too much respect for cinematographers to arrogantly think I can just swan in on set and do their job.” My job revolves around doing everything possible to prevent camera movement, not embrace and control it. I have zero training or experience with how to handle the moving image. I also lack experience in knowing how raw footage will end up edited, picturing how a series of different shots stitch together can sometimes take me a while. My dusty, tired old brain doesn’t even remember being asked to operate their Red Scarlet camera, I just know that on this particular day my skills would be better utilised operating the Red Scarlet than by me stubbornly insisting on taking stills. Having spent countless hours working alongside highly qualified cinematographers, I was fairly confident that I could at least mimic their efforts enough to get by on a day filled with mostly pretty simple set ups. 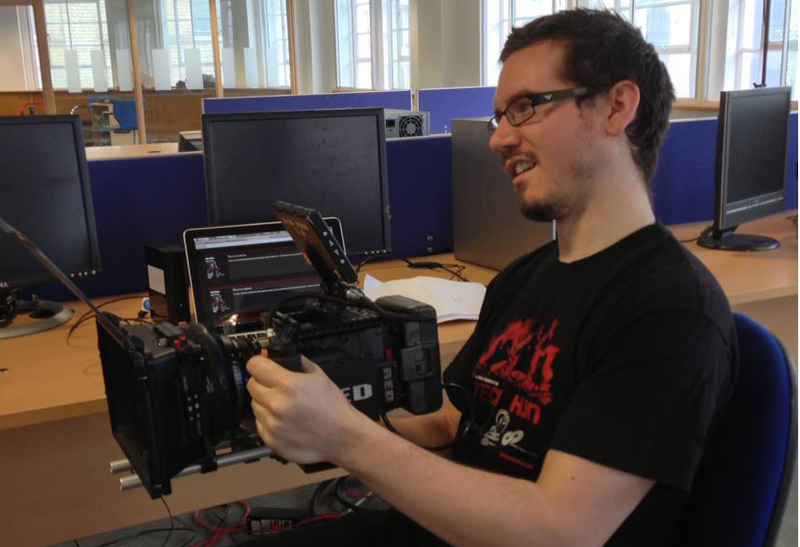 Marc Hankins – Offending cinematographers worldwide since 1987. The value of an image. One thing you pick up very quickly as a photographer is that when you need to stop the crew to take some pictures of a particularly important or visually unique scene, time is your mortal enemy. I’m rarely given more than 5 minutes of free time with actors on a clean set. 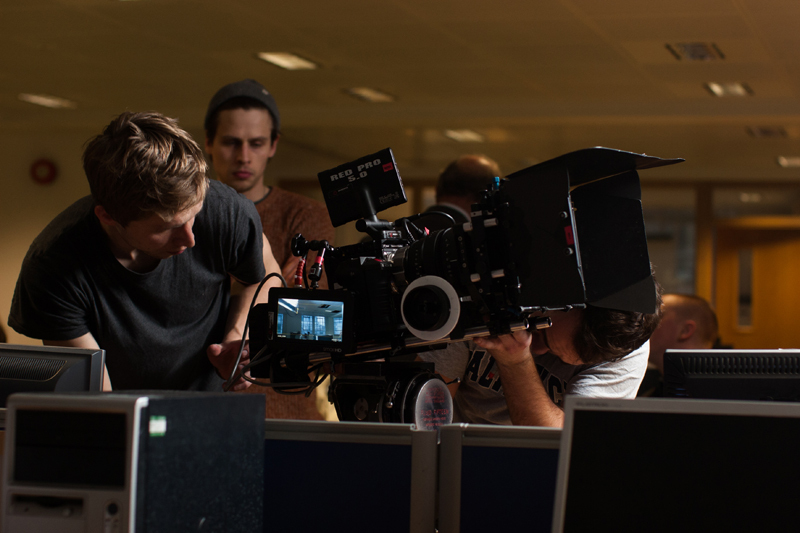 You can feel seconds burning away as the crew grow impatient, wondering why a photograph takes more than 10 seconds. The photographer wants how much time?! Within this small time frame I have to explore a full scene for the most suitable angles, let the actors play through their scene, or direct them myself. Fiddling with the camera to double check that the limited time I’m given isn’t wasted feels like I’m just gawping at my camera like an idiot. Rarely is time given to me to manipulate the location for my suiting, moving furniture out of the way can produce a groan from the crew, let alone a request to move lights or other equipment that frequently finds itself in my frame. Operating the main movie camera on the other hand is a totally different ball game. It’s still bloody hard work, but for very different reasons. If the camera needs to go somewhere for a shot, it will go there. Furniture is moved, lights are repositioned, actors are shuffled around. Almost nothing is more important than the primary camera. Operating the camera is also highly methodical, to use it otherwise is risking a total failure. In between shots I was vigilantly checking the batteries and storage cards, something I never have to do when shooting stills. Using the tripod for nearly every shot is also a huge shift in working style, surprisingly similar to shooting with my Graflex albeit much, much faster. One thing I will say I didn’t like was being forced to use an LCD to focus. I never, ever focus using the screen on DSLRs, optical viewfinders are much easier to judge sharpness, even if they’re not totally accurate in extreme scenarios. The focus assist mode where the camera applies a crazy strong unsharp mask filter was pretty interesting (it makes sharp edges really stand out), though I felt that it made me complacent about the accuracy of my focusing. The other interesting thing was how I struggled with both tracking (pushing the camera along a mini rail system) and follow focusing (refocusing during recording to follow the subject). Tracking I found hard simply because I lack the experience to know how the speed of my movements relate to the footage, and how that ties in with the directors expectations. Similarly, manually follow focusing and being 100% accurate is bloody damn hard! A real, professional movie camera team. Not to confused with me. Would I consider a career in cinematography? I’ll admit that I found the job pretty damn fun, I wasn’t anywhere near as stressed as I thought I would have been. If a brave Director of Photography asked me to give them a hand on their camera team I would struggle to refuse the job, with the caveat that I would need some on the job training, and that follow focusing and general camera movement is beyond my current skill range. You never stop learning on a film set! This entry was posted on June 11, 2013 by marchankins. It was filed under Filmmaking, Photography and was tagged with Camera, Cinematography, Film, Filmmaking, Movies, Photography, Red, Red Scarlet.